The Amazon link is dead. Is this book still available somewhere? I would be interested in buying it. This book never really gained any traction so I am merging the content into a revised version of my Command Line guide. Stay tuned and thanks for reading. Thanks for the reply. I look forward to seeing the new book. My Nmap 6 Cookbook revision will be coming out in a few days with additional content, a few corrections (oops), and various improvements. 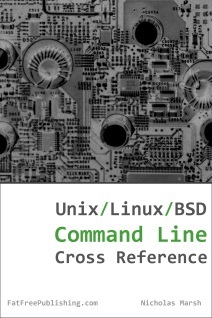 I'm also finishing up a revision on my Unix/Linux command line book which will be done shortly. Both will be available for free promotional downloads in Kindle format for several days during the first month of availability. Email nick fatfreepublishing.com if you want me to notify you when the free download events are happening. Thanks for reading.